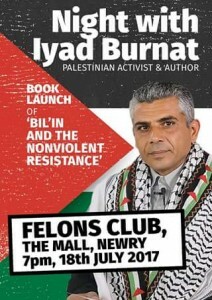 Palestinian human rights activist Iyad Brunat will talk about the struggle of his village of Bil’in against the apartheid wall and Isral’s illegal settlements. 7pm, Felons’ Club, The Mall, Newry. All Welcome.